TwelveTwoTimes: Are Chinese Mothers Superior? We're having this discussion on our team, are Chinese mothers superior? It's a great topic for our team because some of us have experienced the Tiger mom parenting style. We're planning to have a giant discussion panel on this article, including some of our Chinese teacher friends, co-workers, and others. It should be great. Check out the original Wall Street Journal article to read more. 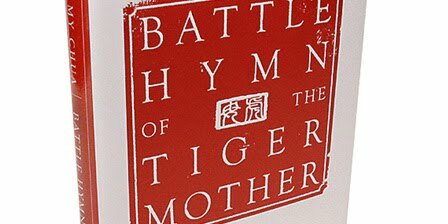 Or buy the book, Battle Hymn of the Tiger Mother by Amy Chua. It's an even more interesting topic personally as we are raising two kids in the middle of the Chinese culture. Everyday we're asked if our kids will go to Chinese school, or when Kanyon will start going to school (according to most we talk with he should have already started).